Dell is flagging up the potential for small businesses to get in on converged infrastructure – using preconfigured hardware and software - with a line of releases announced at its Enterprise Forum event in San Jose. 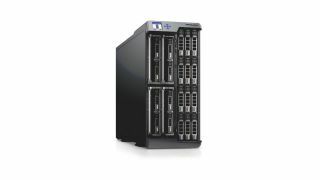 It is playing up the potential for scalable storage platforms with its new generation of Dell Compellent Storage 6.4 array software, which brings together a group of products under the Compellent range. It includes the Compellent Flash Optimised solution, which places data across different types of flash technologies or in combination with traditional drives. Dell says it can reduce storage costs by up to 75% while handling data-intensive workloads. John Everett, Storage Business Manager EMEA, Dell, told TRPro this responds to the falling costs of flash. "The trend is with budgets being reduced IT managers have to ask how they can get the resources to merge active data," he said. "Flash is getting attention because of the cost curve depletion." Dell is also releasing the Compellent SC280 storage system for hosting tiered data, and the Dell Fluid File system (FluidFS), which it says can provide smaller firms with enterprise class file storage at a third of the regular cost. Everett said the key features of the FluidFS are the compression and deduplication functions. The latter can sniff out duplicated copies of data and delete those not needed, helping to optimise the capacity. The announcement on these follows one the previous day on the PowerEdge VRTX system, which brings together servers, storage, networking and management into a single chassis made for small offices. It is bundled with a Chassis Management Controller embedded console, which provides unified control over the various components. Everett said the main appeal of converged infrastructure to small and midsized businesses is in the reduced costs and space savings. This is an important factor when they are looking to grow.